Dizziness is a sensation of spinning around and losing one’s balance. In most cases, this feeling will often clear on its own. If however, you experience repeated episodes of dizziness, have your healthcare provider diagnose the condition to establish the actual causes. Here are some effective home remedies for dizziness. Dizziness is the feeling of being lightheaded or unbalanced. When one is dizzy, one feels like he or she is about to faint or like the surrounding is moving or spinning around. These feeling may at times be accompanied by other symptoms such as nausea and vomiting. Dizziness is a common side effect of inner ear problems such as infection and fluid buildup that can affect your balance. According to mayo clinic, an ear infection is a bacterial or viral infection that affects the middle ear, this is the air-filled space behind the eardrum. Children are more likely than adults to get an inner ear infection. Most of the infections clear up on their own, treatment may, however, be required to manage the pain and monitor the problem. Without proper care, the infection may cause a permanent hearing problem. Hypoglycemia result from a deficiency of glucose in the bloodstream. It is common in people with diabetes, it can, however, occur due to other reasons such as poor dieting, use of certain medication, and doing strenuous exercise. 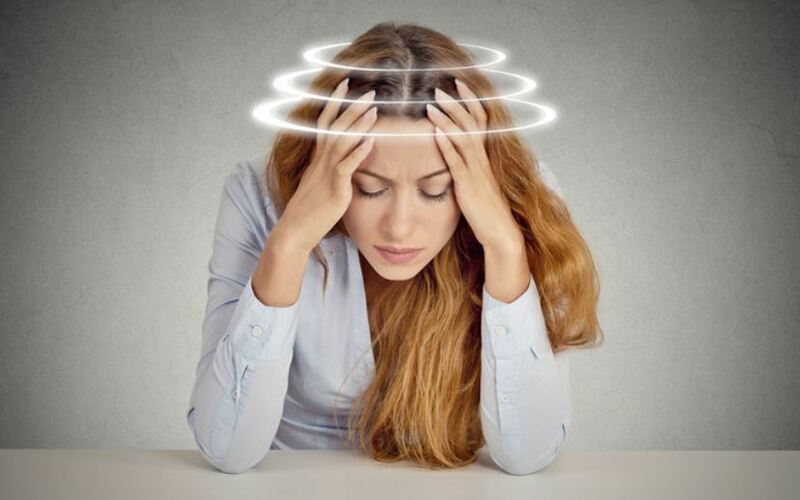 Benign paroxysmal positional vertigo is one of the common causes of vertigo, a sensation o whirling and loss of balance. It is associated with looking down from a great height but can also be caused by disease affecting the inner ear or the vestibular nerve. BPPV can be caused by specific changes in the position of the head. It can cause mild to severe cases of dizziness. BPPV is idiopathic, which means no cause is known. A minor cause is a blow to the head. Anxiety is a feeling of worry, unease, and nervousness about an imminent event or a certain outcome. Common symptoms will include dizziness, lightheadedness, spinning, and feeling as though you might pass out. There are two treatment options for anxiety disorder, psychotherapy, and medication. A combination of the two can be more beneficial. Psychotherapy involves working with a therapist, medication may involve the use of antidepressants and anti-anxiety medication. Also called high blood pressure, it is a common condition in which the long-term force of the blood against your artery walls is high enough to cause health problems. Your blood pressure is determined by both the amount of blood your heart pumps and the amount of resistance to blood flow in your arteries. Generally, the more blood your heart pumps and the narrow your arteries, the higher your blood pressure. Dizziness can also result from taking certain medication. For example, taking blood pressure medication may lower your blood pressure too much thus cause dizziness. Dizziness is also a common side effect of taking sedatives and tranquilizers. Other such drugs include antiseizure and antidepressants. If you start to experience these symptoms after taking such drugs, discontinue the use and talk to your healthcare provider as soon as possible. Epley maneuver is a head and neck tilting exercise that can be used to stop dizziness and lightheadedness. Lack of enough water in your body (dehydration) is a common cause of dizziness. It can result from not drinking enough water or from vomiting and diarrhea which causes excessive fluid loss. When the dizziness is accompanied by nausea or vomiting, the most effective remedy you can use is ginger. When used, this remedy stimulates blood flow to the brain and other parts of the body, this is what helps reduce the intensity of the dizziness. You can also drink ginger ale or tea through the day to overcome the dizziness. Coffee, cigarette and other tobacco products, and alcohol are known to affect blood circulation. When feeling dizzy, you need to avoid all these products. If the dizziness persists, have your healthcare provider diagnose it to establish what the underlying cause might be. When dizziness is a symptom of anxiety, the following home remedies can be used to get rid of the sensation. Over the counter, motion sickness medication can help get rid of dizziness caused by anxiety. In severe cases, stronger motion sickness tablets may be prescribed by your doctor. Maintaining a healthy diet can help prevent dizziness by eliminating many of the conditions that contribute to it. This way, you are able to prevent dizziness caused by anemia, low blood pressure, and low blood sugar. Eat food rich in iron, vitamin A, fiber and folic acid (especially when pregnant). You need to choose foods that are low in fat and sugar. It is common to feel dizzy or lightheaded after a sudden change of position, which is when moving around or after standing up. In such cases, having enough rest is all you need to stop the dizziness. Sit or lie down for some minute to get rid of the spinning sensation. Lemon juice is the other effective home remedy you can use to get rid of dizziness. Lemon contains vitamin C which boosts the immune system that helps your body fight off infection. It also has other nutrients that energize your body and keeps it hydrated. The natural sweetness of raw honey can instantly boost your energy level thus stopping dizziness. Regularly taking honey can also help prevent low blood sugar which is a common cause of dizziness. When feeling dizzy, mix two spoons of raw honey with one tablespoon of unfiltered apple cider vinegar in a glass of warm water. Take the mixture at least twice a day. It is common to experience dizziness and lightheadedness during pregnancy. Common causes include being dehydrated, lacking enough nutrients and fatigue. When the dizziness becomes persistent, the following will help prevent, stop and get rid of the spinning sensation. Vitamin C can help stop dizziness caused by vertigo during pregnancy. To do that naturally, eat a lot of oranges, grapefruits, and strawberries. Vitamin E is known to maintain the elasticity of blood vessels, this helps prevent blood circulation problems that might cause dizziness. You can do this naturally during pregnancy by increasing your consumption of wheat germ, kiwi, spinach, and nuts. Vitamin B-6 may help reduce drug-induced vertigo symptoms such as dizziness or lightheadedness. Vitamin B—6 can also help prevent anemia which is a common cause of dizziness. Spinning your head or body for long can also cause lightheadedness. When this is the underlying cause of the dizziness, you can do the following to stop, cure or get rid of it. Reducing the amount of emotional stress. This can be done using medical treatment, and activities such as yoga and meditation.